The wonderful producers at All Souls’ tortillas use locally-grown, organic heirloom corn to craft delicious, fresh tortillas every day. They use the traditional process of stone-grinding fresh masa (corn meal dough) each production day for the best-tasting, most nutritious tortillas. Heat the tortillas over medium-high heat in a skillet to impart a smoky, toasty flavor before using them with your favorite taco or quesadilla recipes! Eat This First: Leafy greens (lettuce, tatsoi, and arugula) and asparagus. Tatsoi can be used in recipes that call for spinach, or try the recipes below. Asparagus should be stored in the fridge in a glass with one inch of water, and the top covered loosely with a plastic bag. Change the water if it begins to appear cloudy. Omnivore members: There are three different cuts of steak coming to you this week--check the label to see which one you got! The steaks in this week's basket can all benefit from a quick sear in a hot pan, rather than "low and slow" cooking. In general, let steaks come to room temperature and pat dry before cooking; season both sides generously with salt and pepper. Heat a cast iron skillet or grill pan over high heat, add a tablespoon or so of canola oil, and then add the steak, reducing heat slightly if the steak appears to be cooking too quickly. For Delmonico steak, sear approximately 2-3 minutes per side for medium-rare. Sirloins can benefit from being marinated for 6-12 hours before cooking. Remove from marinade, pat dry, and sear approximately 3-5 minutes per side depending on thickness. Check with a meat thermometer if desired (approximately 120 degrees F for medium rare). For a T-bone, sear approximately 4 minutes per side, and then transfer to a 450 degree oven and roast about 6-8 minutes for medium rare (120 degrees F on a meat thermometer). Make sure to rest all steaks before cutting! John and Nancy Hayden use ecological practices that maintain harmony with nature to grow a large variety of cold-hardy organic fruits and fruit nursery plants. They also have a 14-acre pollinator sanctuary on their farm, which helps to support native bees, butterflies, and other beneficial insects. One of their favorite things is sharing the joys of growing your own food with others. Enjoy their rhubarb in your Vermont Vegetable baskets this week! Eat This First: Lettuce, Chives, and Cucumber - these are the most perishable. Store lettuce with a paper towel in the bag to absorb excess moisture, and add chopped chives to everything from softened butter to scrambled eggs! Eat This First: Lettuce and Cucumber - these are the most perishable. Slice up your cucumbers - make a quick-pickle if you'd like - and serve with lettuce for a really refreshing spring salad! These recipes used the majority of the basket's contents, as well as some pantry staples. 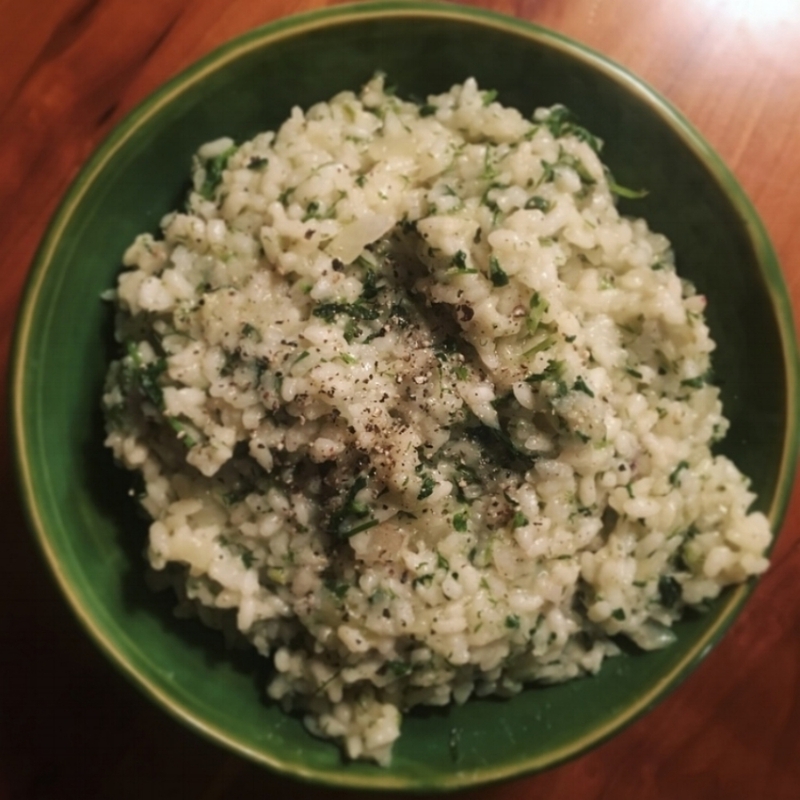 Dill and pea shoots lend fresh Spring flavor and vibrant color to this creamy herb risotto. To begin, bring seven cups of chicken or vegetable broth to a simmer. While your stock warms up, chop dill and pea shoots (or whatever greens you are using), mince garlic, and combine in a bowl with a handful of Parmesan cheese, and set aside. In a dutch oven or a heavy-bottom sauce pan, heat a couple tablespoons olive oil over medium high heat. Add one finely chopped onion, season with salt and pepper, and cook until soft, about five minutes. Then, add 1.5 cups Arborio rice, and cook until rice begins to crackle, about 2 minutes. Begin adding the simmering stock, a half cup at a time, stirring gently. The stock should just cover the rice and should be bubbling - but don't let it overheat and dry out as you cook. When the rice is just tender all the way through, but still has a nice "al dente" texture, it is done. This usually takes about 25-30 minutes. Stir in the your mix of herbs, garlic, and parmesan cheese, and juice from one lemon. Serve warm. Braised cabbage makes a great topping to a salad, but is also equally delicious on its own. Heat olive oil in a large non stick. Add thinly sliced cabbage and a splash of apple cider, which lends a mild apple flavor. Stirring occasionally, cook until cabbage becomes a deep purple, 20-30 minutes. I put the cabbage on top a bed of mesclun greens with a splash of lemon dill vinaigrette. 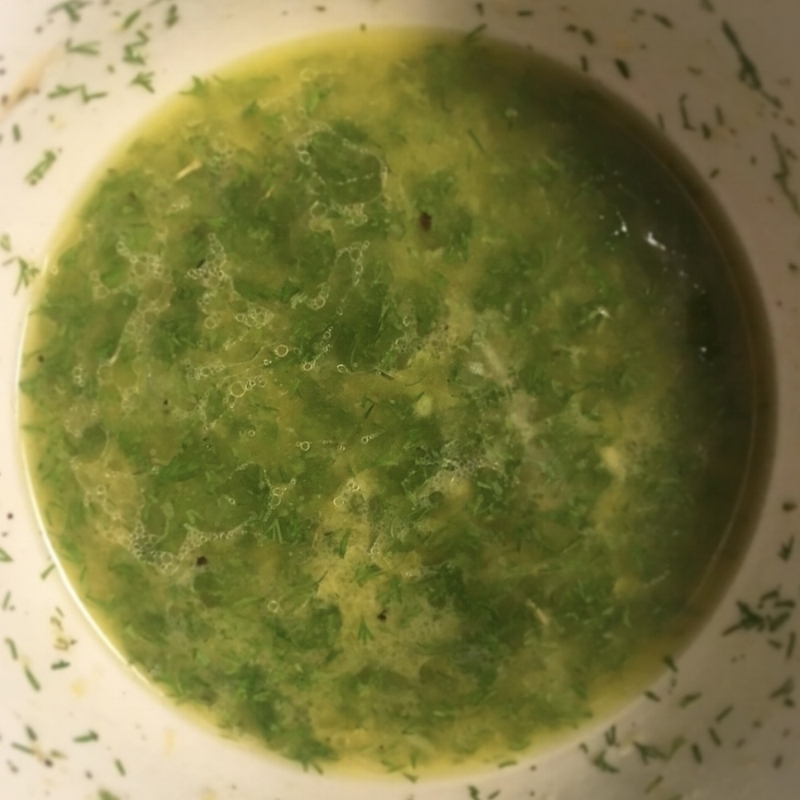 I made this by simply whisking together 3 parts olive oil, 1 part vinegar, 1 part lemon juice, and fresh dill. These pan-seared steaks with chimichurri sauce are a great way to kick off summer grilling. Let steaks sit at room temperature for 30 minutes. Pat dry and season heavily with salt and pepper. Put a grill pan over high heat. When the pan begins to smoke, hold the steak with a pair of tongs above the hot pan. Find the edge of the steak that has a strip of fat on it. Hold the fat-covered edge of the steak in the pan with the tongs until it releases some grease and browns. Then, lay the steak on a flat side and cook it for a few minutes, until it browns. Flip it over and cook it on the second side. Remove from grill pan and tent with foil for 10 minutes. (Make sure you don’t cook the steak quite up to your desired doneness - because it will continue to cook while it’s resting). Slice thinly against the grain and serve with chimichurri sauce. We love this Chimichurri sauce on just about anything - grilled vegetables, steak, even salads. Yum! We'd love to hear your feedback! Let us know what you think in the comments below, or send an e-mail to kendall@intervale.org. Click here to visit our newsletter for the week, with details about farmers and food makers, plus even more recipe inspiration. Our meal plans use ingredients from our Localvore Package, which includes our Vermont Vegetables, plus local meat, dairy, and specialty ingredients, as well as eggs and bread. We add simple pantry basics, such as beans, pasta, grains, butter, olive oil, salt and pepper, hot sauce, to create our weekly meal plans. We hope our meal plan ideas will make it easy for you to prepare delicious meals at home! Weekly meal plans are crafted by Sophie Johnson. Sophie is a Junior at the University of Vermont studying Food Systems. She has been the Intervale Food Hub's Marketing and Outreach intern since September, 2016. Eat This First: All of the greens-- dill, mesclun and pea shoots! Plus, some Does' Leap Feta Cheese that we had left over from last week! This quick mushroom and chard strata can be served for any meal, and makes excellent use of day-old bread. Slice the loaf into half inch cubes, then toast about five minutes, or until golden brown, in an oven at 375°. Meanwhile, melt a tablespoon butter on an ovenproof skillet, then add sliced mushrooms and cook until soft, about five minutes. Season with salt and pepper. Add the chopped chard. In a separate bowl, whisk four eggs with a half cup milk and cheese. We used feta, but anything you have on hand would be delicious. Add the bread to the egg and milk mixture, toss to combine, then add to the skillet. Stir until all ingredients are evenly distributed, then press down to flatten. Bake, covered, for ten minutes. Remove the cover and bake for about five minutes more, until the center is set. Let cool, briefly, then slice and serve. Baking salmon wrapped in foil assures the fillet cooks evenly and doesn't dry out. Top the fish with some pats of butter, salt, pepper, and whatever seasoning you wish (lemon and dill is a favorite of mine). Wrap tightly in foil and place on a baking pan. Bake until salmon is cooked through, or easily flaked with a fork. Depending on the size of your fillet, this can take between 15-40 minutes. Sautéed bok choy pairs nicely with salmon. Heat olive oil in a nonstick pan over medium high heat. Slice the bok choy in half lengthwise, then add to the pan cut-side down. Cook until a golden sear forms, about 3-4 minutes. Add a quarter cup chicken broth to the pan, then cover and cook for five minutes more, or until the tops of the vegetables are tender and most of the liquid has evaporated. Serve alongside salmon. Corn tortillas are the perfect vehicle for any type of food; a much tastier blank canvas. Here, I topped them with crispy sweet potatoes and spinach. Simply peel the sweet potatoes, then dice into quarter-inch cubes. Boil until fork-tender, about ten minutes. If time is of the essence, microwaving them for 3-4 minutes works too. Heat oil on a nonstick over high heat, then add the cooked sweet potatoes and cook until golden brown and crispy. Add the spinach, and cook for thirty seconds, when it's just beginning to wilt. Pile the mixture on top the tortillas. Add a fried egg, beans, salsa, or avocado for a heartier meal. Micro greens will deliver a pop of green, satisfying crunch, and a little spice to any of these dishes! Don't overlook a year round classic; this menu is as delicious in the Spring as it is in the Fall! We began by assembling a simple salad. First, tear the kale into bite size pieces. I found no need to sauté or massage the greens, they were plenty tender straight out of the bag. I boiled the beets in just enough water to cover them and a splash of vinegar, to keep them from bleeding. Boil until fork tender, approximately forty minutes to an hour, depending on the size, then rinse with cold water. The skins can easily be peeled off. Chop and place onto the kale, alongside crumbled feta. To top the salad, I made a quick strawberry vinaigrette. Blend together your thawed strawberries, a splash of olive oil, apple cider vinegar, honey, then season with salt and pepper. If the dressing comes out too sweet, add more oil. Pork chops with apples is a classic pair - the sweet and savory combination is delicious! Heat a couple tablespoons olive oil in a cast iron skillet or heavy nonstick pan over medium-high heat. When pan is heated, add the pork chops and cook about five to seven minutes each side, or until a golden sear forms. Remove them from the pan, cover with foil to keep warm. Add sliced apples to the pan, and sautéed in the pork's drippings, for about fifteen minutes or until golden brown. Serve the apples with pork, and season with salt and pepper. Mashed potatoes are a delicious side dish to the pork chops - or to any protein that you're making at home this week.To begin the garlic mashed potatoes, peel the potatoes, then cut into uniform chunks. Add to a skillet, then cover with water. Peel several garlic cloves (I used five) and add them to the potatoes. Bring to a boil, then reduce heat to medium and cook until fork tender, twenty to thirty minutes depending on the size. Drain, return to pan, add butter and milk, then mash to whatever consistency you desire. For an easy dessert, I made apple crisp. This is a great way to utilize off-season apples. (Try serving with ice cream for dessert, and with plain yogurt for breakfast!) Peel and slice five to seven apples, toss with sugar and cinnamon, add mixture to a buttered baking dish. Combine a half-stick melted butter, a cup of oats, and a half cup of brown sugar (or maple syrup as a sugar substitute); sprinkle over the apples and bake at 375° for about forty minutes. Our meal plans use ingredients from our Localvore Package, which includes our Vermont Vegetables, plus local meat, dairy, and specialty ingredients, as well as eggs and bread. We add simple pantry basics, such as beans, pasta, grains, butter, olive oil, salt and pepper, hot sauce, to create our weekly meal plans. We hope our meal plan ideas will make it easy for you to prepare delicious meals at home. First, I washed and chopped the mushrooms and chard (spinach or kale work well too) into strips. I sautéed them on a nonstick pan with butter and minced garlic until golden brown, about ten minutes. I added a splash of cream, seasoned with salt and pepper, then stirred in about three cups of cooked pasta. I let the flavors meld for another ten minutes, stirring occasionally, then finished off the mushroom pasta with a generous sprinkle of parmesan cheese and fresh parsley. Pasta with shiitake from AH Mushrooms, chard from Miskell's Premium Organics, and parsley from Red Wagon Plants. Not pictured here is a yogurt dipping sauce that paired well with the spicy wings and sweet potato fries! I stirred in a little bit of salt and pepper, spice, garlic, and fresh parsley into Butterworks Farms plain yogurt. Plain yogurt is a great base for making dips. Curried Sweet Potato Fries with sweet potatoes from Burnt Rock Farm. For a simple and satisfying side, I made curry-spiced sweet potato fries. Cut the potatoes into matchsticks, toss with olive oil, salt, pepper, and whatever spice you have on hand. I used curry powder, but in the past have used paprika, chili powder, or cinnamon; all yielding equally delicious results. I roasted these on parchment paper while the chicken wings were also in the oven (about 30 minutes at 400°), tossing halfway through. Tip: For extra crispy fries, be sure to preheat the roasting pan. Chickpea Yogurt Dip with yogurt from Butterworks Farm and parsley from Red Wagon Plants, served with Ciabatta from Red Hen Baking Company. Finally, I prepared a chickpea yogurt dip. I mashed a can of organic chickpeas, stirred in some yogurt, chopped parsley, salt, pepper, and finished with a splash of olive oil. Using a blender would give you a smoother texture, but we were happy with our more rustic results, too! The refreshing dip was excellent served with a chewy baguette, but could also pair well with crudités (there is a good chance you have a few carrots in your fridge that would be a great combination). Eat This First: Eat those greens - Pea Shoots, Parsley, Spinach & Kale! Members have been asking us about weekly meal plans and meal prep ideas for years! So, we're finally diving in. Each week, we will create meal plans using the local, seasonal ingredients from our Localvore Package, which includes our Vermont Vegetables, plus local meat, dairy, and specialty ingredients, as well as eggs and bread. We aim to keep our meals simple, and to focus on basic ingredients from our Vermont farmers and food makers. We hope that these meal plans will make it easy for you to prepare delicious meals at home. Please share your feedback and ideas so with us so that we know what you like to see in a weekly meal plan! Respond in the comments below, or send an e-mail to kendall@intervale.org. This week's Localvore Package basket included organic kale, sprouts, potatoes, carrots, parsnips, Eco-Apple Certified apples, as well as cheddar cheese, grass fed ground beef, caramel sauce, Waitsfield Common bread, and pasture raised eggs. We created three delicious, yet utterly simple meals to help you use all of the ingredients in your basket. These recipes took an hour total to make, and used the majority of the basket's contents. First, we peeled and chopped the carrots, parsnips, and potatoes. Remember that the smaller the pieces, the faster they will cook. We tossed them with olive, salt, and pepper, as well as a splash of maple syrup over the carrots. Roast in a 400° oven for about forty minutes, or until fork-tender. We served these roasted vegetables over the kale, alongside sprouts and a couple chopped apples for a colorful salad. We also made an omelette to take advantage of the sprouts and cheddar. Simply melt a tablespoon of butter in a small non-stick pan over medium heat; whisk three eggs and some grated cheddar in a separate bowl. Pour the eggs into the pan, swirling to evenly distribute contents. When the edges look set, put in a large handful of the sprouts, fold to one side and cook for three minutes more. 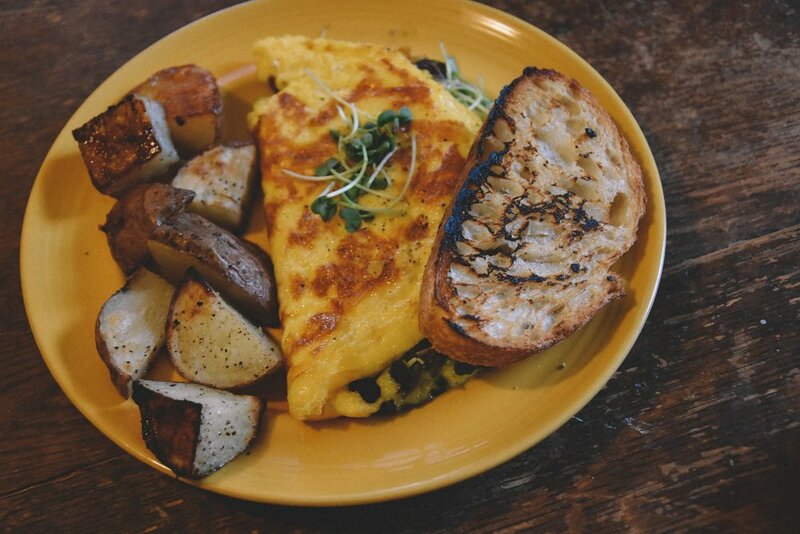 We served the omelette with toast and a portion of the roasted potatoes. Lastly, we made two versions of grilled cheese: a kale, cheddar, and apple version, as well as one with cheddar, apple, and caramel sauce (a delicious sweet-and-salty combination!). Similar to the omelette, melt butter (or olive oil or cooking spray) over medium heat in a small non-stick. Slice the bread, grate the cheese, thinly slice the apples. Assemble the sandwiches, and cook about four minutes per side, or until golden brown. Click here to view our newsletter for the week, with details about farmers and food makers, plus even more recipe inspiration. Owner Rob Rock (pictured on the far right, in the bottom row) also designs and builds tools, equipment, and digital apps for small farms through his company, Upstream Ag. These inventions are pretty awesome - including his "Flame Weeder," featuring a few flame-throwers, and his "Prone Weeder," which allows farmers to lie face-down to pull weeds in comfort! Check out his inventions at upstreamag.com. Eat This First: Microgreens and Red Russian Kale! Be sure to eat your microgreens ASAP for the best flavor and nutrition. Eat This First: Lettuce, Spinach and Parsley! Does’ Leap is an innovative, diversified organic farm specializing in a variety of fresh and aged goat cheeses, kefir, and farm-made, artisanal sausage. Their goats and livestock are raised outside except in the coldest months, and the farm's lush green mountain location provides plenty of wild forage for them to eat. Does' Leap Farm is one of the few goat dairies in the country that rely on a mixture of pasture and browse (shoots or twigs of shrubs and trees) as the primary feed source for their goats. As a result, their cheeses and meats are of exceptionally high quality and take on the flavor of Vermont’s changing seasons. Eat This First: Celeriac, Green Cabbage and Kale! Is Celeriac (also known as Celery Root) a new vegetable in your household? Don't be shy! Dig right in - peel off the rough, nubby outer skin and you'll find a smooth white veggie underneath. We often use celery root as a replacement for celery - this works especially well as a base for a soup, or added to mashed potatoes, or added to a mixture of roasted root vegetables. See "How to Peel Celery Root" under the recipes below! Champlain Orchards is 100 year-old orchard located in Shoreham, Vermont. It's currently owned by husband and wife Bill Suhr and Andrea Scott, who run the orchard with a robust crew. The apple orchard and organic farm have a beautiful view of Lake Champlain toward the Adirondack Mountains. They grow a wide variety of fruit, including over 40 varieties of apples, using Eco Apple Certification methods. This Integrated Pest Management (IPM) strategy uses the most eco-sensitive, minimally treated, natural methods possible to grow fruit! Learn more at champlainorchards.com.